I think I`ve been reading too many book series. The kind that have similar names for all of the books in the series, You know, as in Bared to You, Reflected in You, Entwined in You. Or Divergent, Insurgent, Allegiant. And so it goes in the blog: Home new home and Home Cold Home. It’s been a year since I went home. This year I was lucky enough to go home again, during the semester break. We were given one week off, but with 2 weekends it bookending the week it amounted to almost 10 days. Still not nearly enough, grateful as I was for the opportunity to go home. Unlike the last time, when I tried to meet everyone and go everywhere, on this trip all I wanted was to stay home, hug my dogs and spend time with my family. I’ve noticed that I tend to blog mostly about positive things. I do want to be more positive and less grumpy in general, so I guess that’s a good thing. However, this meant I haven’t felt like blogging for a while. I haven’t had the easiest time teaching in the second quarter of 2014. In fact, it is fair to say I`ve had to deal with some of the most challenging students in my teaching career. The mix of bad attitude and unhealthy group dynamics made every lesson a bit of an uphill struggle (Sisyphus with his enormous rock comes to mind). A colleague of mine used to say that you can bring a horse to water, but you can’t make it drink, meaning that as a teacher your job is to create the best conditions for language learning but ultimately it is up to the students to actually learn. What she didn’t mention is the horse bucking and kicking as you drag it towards the water, occasionally thwacking you in the face with its tail and stomping on your feet. Yeah, like I said, not the most motivated bunch. But there is a silver lining – the challenges I faced did help me develop as a teacher and forced me to become more inventive and creative. Yet it wasn’t all bad.There were some meaningful connections, the most memorable of which has been dinner with a student and his family, more on which is to follow in a separate post. I`ve left it too long to blog. There were so many things I wanted to write about – a very difficult second quarter, equally difficult third quarter, a trip to Istanbul, a trip to Ankara, a trip home, a new house, and many things in between. But the longer the list grew, the more daunted I became by the self-imposed backlog of stories. So, in order to make myself write again I decided to temporarily absolve myself and suspend the catching-up and just write about what’s on my mind. What happened yesterday was that I got a terrible stomach bug. Or food poisoning. Or are they the same? With our first quarter coming to an end, my students and I realized it’s nearly time to say good bye. Nobody knows what our schedules will look like next quarter and whether I`ll be teaching any of the same students again – although, considering we have 3 more quarters to go, I might well encounter some of them again. However, the prospect of parting ways prompted my students into suggesting a class party. The word party has a more innocent meaning when applied in the context of a prep school in a conservative Turkish city – it simply means staying after classes, eating some cake and assorted snack and drinking soda. Last year, I`ve been to several of these celebrating the end of a quarter, including several impromptu gatherings with food in the middle of the day for no apparent reason. One thing I loved about living in Russia was how many public holidays there were. Around 10 days for New Year, 5-7 days for May holidays (Labor Day and Victory Day), and then a few one-day holidays sprinkled throughout the year (International Women’s Day, Defenders of the Fatherland Day etc). And they do this cool thing where if a holiday falls on a weekend, you get the following work day off! So I`m glad that here in Turkey there are also quite a few public holidays. This week we got 1.5 days off for Republic Day which commemorates the fact that Ottoman Empire was was proclaimed a republic and named the Republic of Turkey in 1923 by Mustafa Kemal Atatürk. To celebrate, many people and institutions display the Turkish flag, often accompanied by a flag depicting Ataturk. Unfortunately, beyond this I don’t know much more about how this holiday is celebrated because for the second year now we left the city but judging from the photos in a fellow blogger’s post, the celebration involves people carrying flags. For us, it was a chance to get out of the city – much easier now that we have a car and have some fun with friends. Actually, we got inspired by another friend who was going on a day hike around Ihlara Valley and decided to join them, fully determined to hike all day, but as often happens with good intentions, they were not fully realized. Isn’t this that all (or at least most) moms do when they visit their children? Even if the said children are 30-year old married English teachers. Yep, my momma visited me from Russia and it was wonderful! (Except for when all three of us had to share a hotel room where the bathroom had no door but more on that later). 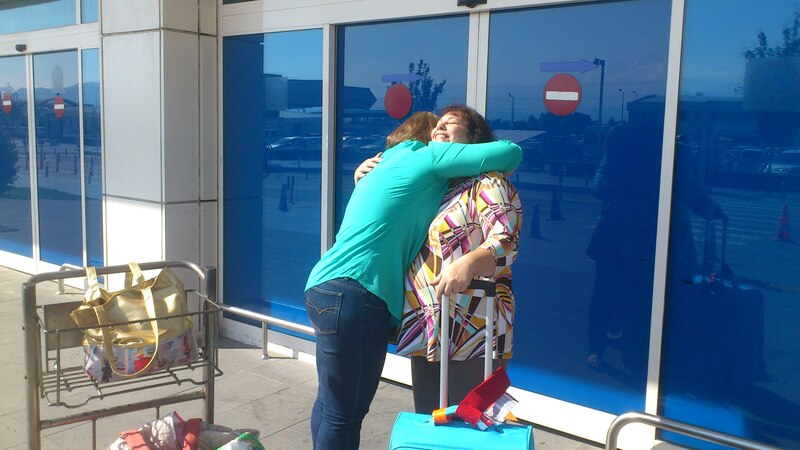 I had been looking forward to her visit ever since we booked her tickets in May and so, on the day of her arrival, I was nervously pacing outside domestic arrivals, worried about mom getting on without English or Turkish, but I underestimated her. She got here all right, along with a suitcase full of presents for us and even our friends. She even brought me a whole electrical steamer! Several people have recently told me that they have read and enjoyed my blog. When this happens I feel a rush of joy but also a pang of guilt because I haven’t written for a while. There two main reasons for that. (Excuses, excuses!). Since it’s our second year here many things that seemed exotic this time last year are now ordinary. Also, I always seem to wait for some sort of events to occur to blog about, but then get daunted by describing the whole thing and give up altogether. Add to this the usual madness of working, going to yoga, studying for an exam in December, cooking etc. and there’s precious little time remaining to sit down and ponder what to write about. But today the stars have aligned in a way that motivated me to sit down and write. 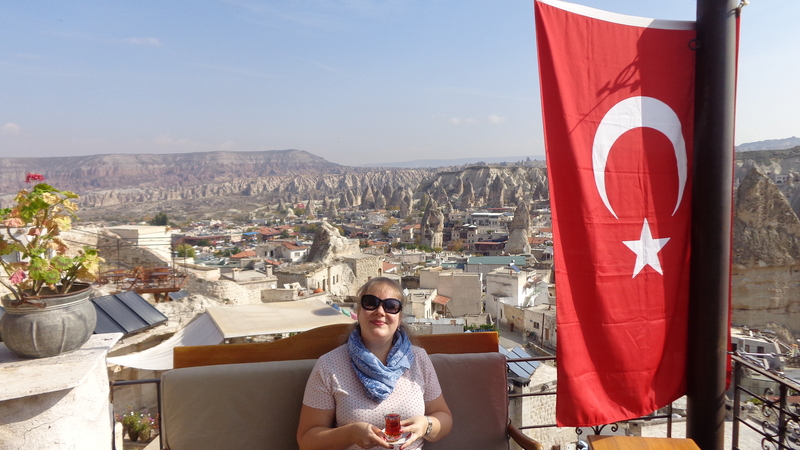 In fact, I`m already sitting down, wrapped in a souvenir poncho I bought in Cappadocia, with a cup of tea and the radio playing at the background. The exam practice is done for the week, I`ve done some revision with Mike’s help and even though there’s always more to be read/revised, I decided I`ve had enough for one day. Along with hot air balloons, underground cities are another sight eponymous with Cappadocia. 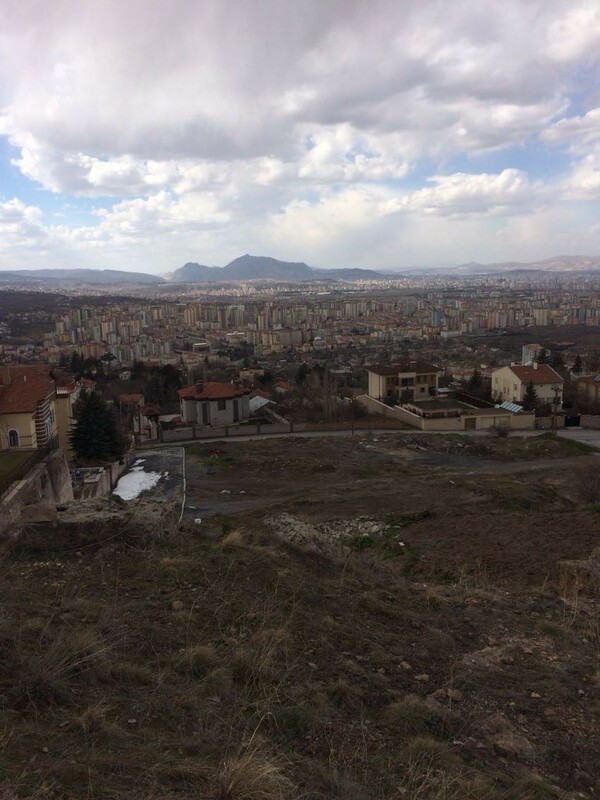 In fact, there are even underground cities here in Kayseri. There’s one in old Talas, really close to where we live and one recently discovered – under a residential house! Read the story here. 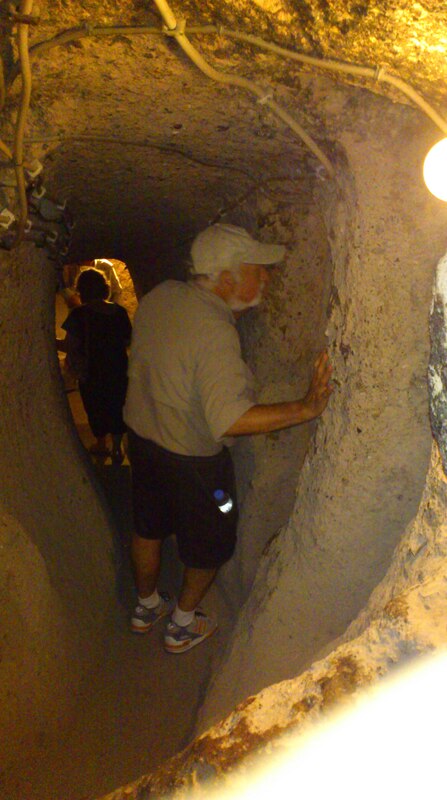 It was once such underground city, this one called Kaymakli, that was our destination on a hot August day.